A customised special mattress needed to relieve pain. A donation campaign in the Kronenzeitung newspaper at the beginning of December called attention to the fate of 16-year old Marcel. The young man from Mühlviertel suffers from a severe handicap, from which associated pain often occurs, especially during the night. In order to ensure that the pain doesn’t get too unbearable, Marcel has to be repositioned at regular intervals during the night. Therefore, his biggest wish was to have a special mattress to relieve his pain. When this moving story reached Wenatex, the company owner knew right away that Wenatex had to help and that the company would fulfil this wish.In the company’s own production plant in Ranshofen, Austria, a customised mattress was manufactured for the 16-year old. The mattress in question is an anti-bedsore mattress especially designed to suit Marcel’s special needs. The mattress should help to slow down the degenerative process and to alleviate the pain that Marcel suffers. It is our absolute pleasure to be able to fulfil Marcel’s biggest Christmas wish and to know that he will now be able to sleep better at night. 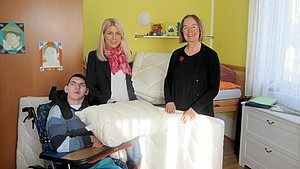 “Of course, lots of other Kronenzeitung readers have also donated for Marcel, and perhaps he will now also be able fulfil another wish or two.” explains Wenatex Director.Marcel was given his belated Christmas present at the residential house in Gallneukirchen by Nadine Wernicke herself. In addition to the mattress, Wenatex also donated a pillow and a duvet.